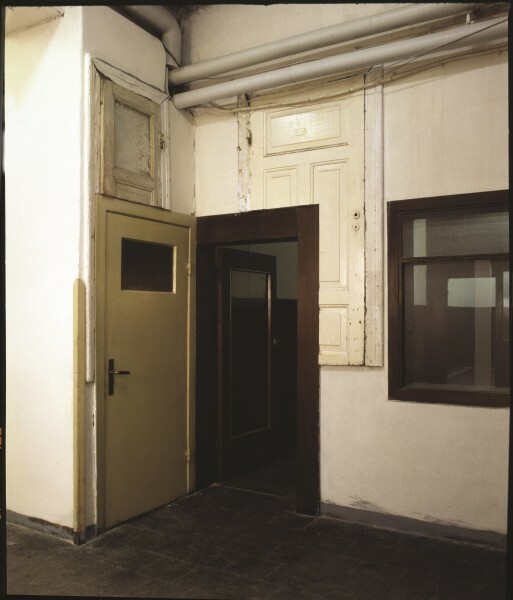 "For this exhibition we were given a space what was strongly burdened with the past: at the beginning of the 20th century it served as a boxing hall, than a fascist printing house, later a storage and a department store... imagine a hundred by fifty meter hall with various connecting rooms. We received a small corridor with several doors. I invented my work for this space. The idea came from the Hungarian countryside's vernacular architecture: due to financial reasons when in their houses they wanted to abolish a door or window, they didn't remove them, just simply masoned them. When later a new window or door was needed on the same wall, they didn't take into account the old existing one, but they cut it through. I thought it would be interesting to reflect the past of the given space this way: I took old, waste doors and placed them one meter high, as if they were left from a run-down historical past.